The enchanting Venetian Lagoon, the golden sands of the Adriatic Coast and the peaceful countryside of the Friuli region are yours to discover on this week-long boating holiday. A perfect route for first-time boaters who wish to experience the delights of the city. This itinerary steers you clear of the busy waterways around central Venice, directing you instead to neighbouring islands so you can use the speedy water-taxi service to get you to the thriving city centre. Day 1: Precenicco to Marano Lagunare 15km / 0 locks / 0 Lifting Bridges / 1.5hrs of cruising Cruise down the peaceful River Stella and head across the Marano Lagoon to Marano Lagunare, an old fishing village full of character. The main square, dominated by the beautifully restored millenary tower, has an excellent choice of seafood restaurants. Buon appetito! Day 2: Marano Lagunare to Concordia Sagittaria 40km / 1 lock / 1 Lifting Bridge / 4hrs of cruising Head back across the Lagoon to join the canal which runs along the sunny Adriatic Coast towards Venice. A detour north will bring you to Concordia Sagittaria and neighbouring Portogruaro, where a guided walk will reveal the fascinating Roman history of these two pretty towns. 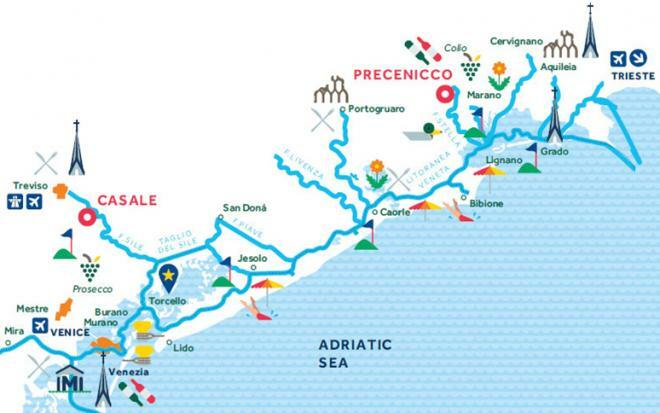 Day 3: Concordia Sagittaria to Caorle 25km / 0 locks / 2 Lifting Bridges / 3hrs of cruising Your next stop is Caorle to admire the traditional coloured houses and explore the quirky shops and boutiques. Enjoy delicious ice cream in one of the many Gelateria and stroll to the beach for a dip in the Adriatic. Day 5: Lido di Jesolo to Vignole (Venice) 30km / 1 lock / 0 Lifting Bridges / 3hrs of cruising After a morning on the sand, cruise onward to the Venetian lagoon to moor in Vignole. A speedy Vaperetto ferry will take you into the heart of Venice. Marvel at St Mark’s Square and visit the famous St Mark’s Basilica, and tour the Doge’s Palace next door. Take the elevator to the top of the Campanile, the iconic bell-tower, for great views of the Square and beyond. Day 6: Vignole to Burano 10km / 0 locks / 0 Lifting Bridges / 1hr of cruising Before departing Venice, wander around the famous Rialto market and the impressive Rialto Bridge next door. And don’t leave without taking an iconic Gondala ride! After lunch, take a vaporetto to the Island of Murano to visit one of the many glass factories to admire the master glass blowers at work. 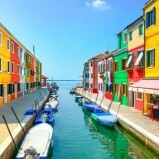 Day 7: Burano to Casier 40km / 1 lock / 0 Lifting Bridges / 5hrs of cruising In Burano visit the lace-making museum and stroll around town admiring the multi-coloured houses. Don’t miss San Martino Church with its crooked bell tower. Your week ends with a leisurely cruise out of the lagoon and up the River Sile to Casier for a farewell dinner in the excellent Ristorante Trattoria al Sile.